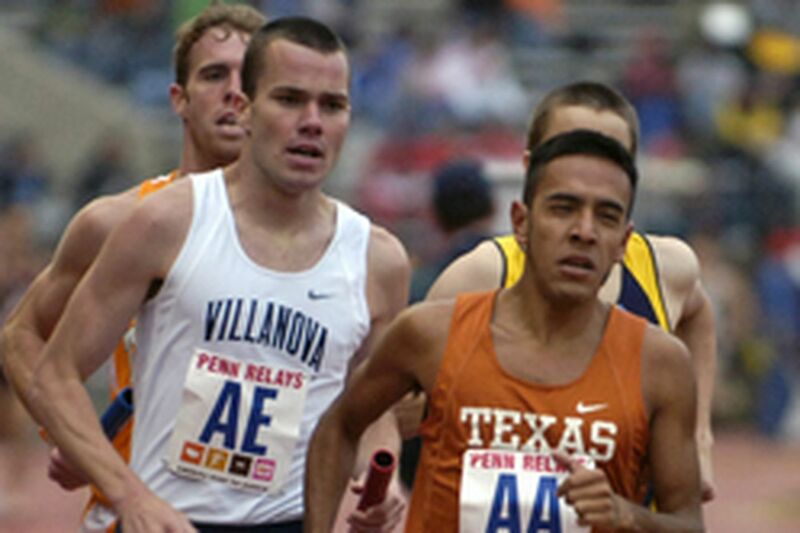 Villanova's Robert Curtis tries but can't overtake Texas' Leonel Manzano in distance medley relay. THE OLYMPICS are a little more than a year away, but it's never too early to start thinking about them, and maybe even catch a glimpse of some of the talent that could represent the United States in Beijing next summer. Today at the Penn Relays, the USA vs. the World competition will take place at Franklin Field, beginning with the women's sprint medley. This usually means a lot of friendly chaos among fans, half of whom root for the United States, with many of the rest cheering on Jamaicans. "It feels good when you look into the stands and see all the Jamaicans cheering for you," said Jamaican standout Sherone Simpson, who was ranked No. 1 ranked in the world last year in the 100 meters. "That motivates me to run faster, if anything else." Even though the United States has dominated the men's and women's competitions over the past 6 years, neither side likes to call it a rivalry. "You don't really feel the tension from Jamaica, more than you feel just the natural aura in the stadium, period," said American Lauryn Williams, the world champion at 100 meters. "It's almost like the World Championships, with the all the energy and excitement in the atmosphere." Williams, of Rochester, Pa., will run in the 4 x 100 relay. Williams is returning to Franklin Field for the first time since 2004, when she starred for the University of Miami. Her mother, two sisters and best friend are planning to attend the meet to make her fell even more at home. Even though Williams is now a world-class athlete, she doesn't forget how nervous she gets. She noted that although the Penn Relays aren't World Championships, it's still a big event. "I think it's less pressure, but you can still get nervous," said Williams. "For us, it's just a chance to showcase our talent. But I can remember running in here during college in front of the USA runners and wanting to make sure I did good so I could impress them. It can be kind of intimidating. I guess now I am the bigger athlete and they'll be looking at me the same way. Hopefully, that will motivate them." Tyson Gay, ranked No. 1 in the world in the 200 meters by Track & Field News, and his former college teammate, Wallace Spearmon, will run the first two legs of the men's 4 x 100 relay today. Since Spearmon and Gay began running together 3 years ago at Arkansas, they have not lost a race. At the World Cup in Athens, Greece, in September, the duo led the men's 4 x 100 team to 37.59-second meet record, the fastest recorded time since 1999. It was the fifth fastest time ever run. "I feel like we are the new breed of runners," said Spearmon, the 2006 USA outdoor champion. "While I appreciate everything the ones before us have done, I think it's the right time for us to go ahead and make a name for ourselves." Leonel Manzano couldn't tell exactly who was inching near him down the stretch of the men's distance medley, so he took a quick peek at the Franklin Field jumbo screen. But it didn't really matter. It was merely a signal to the Texas junior that it was time to turn it on. "I heard something, but I wasn't too sure who it was behind me. So I just thought to myself, 'OK. Time to go now,' " said Manzano, who anchored the Longhorns to a second straight distance medley championship with a time of 9:29:60. The footsteps were those of Villanova's Robert Curtis, whose team finished second at 9:32:00. While some might have looked at the terrible weather conditions and a 2-hour delay as a handicap, it actually played into Texas' favor. After the Texas Relays got drenched 2 weeks ago in Austin, the Longhorns were more than prepared for yesterday's conditions. "I think the weather turned out to be great once the day went on," said Erik Stanley, who ran the first leg. "Honestly, you can't really blame the weather if you win or lose, because everyone has to run in the same conditions, which means you have to stay on top of your game."